Background: The principal aim of this report was to study second primary malignant neoplasms (SMNs) in long-term survivors of pancreatic ductal adenocarcinoma (PDAC) with regard to the germline genetic background. Patients and methods: A total of 118 PDAC patients after a curative-intent surgery who were treated between 2006 and 2011 were analyzed. Of the 22 patients surviving for >5 years, six went on to develop SMNs. 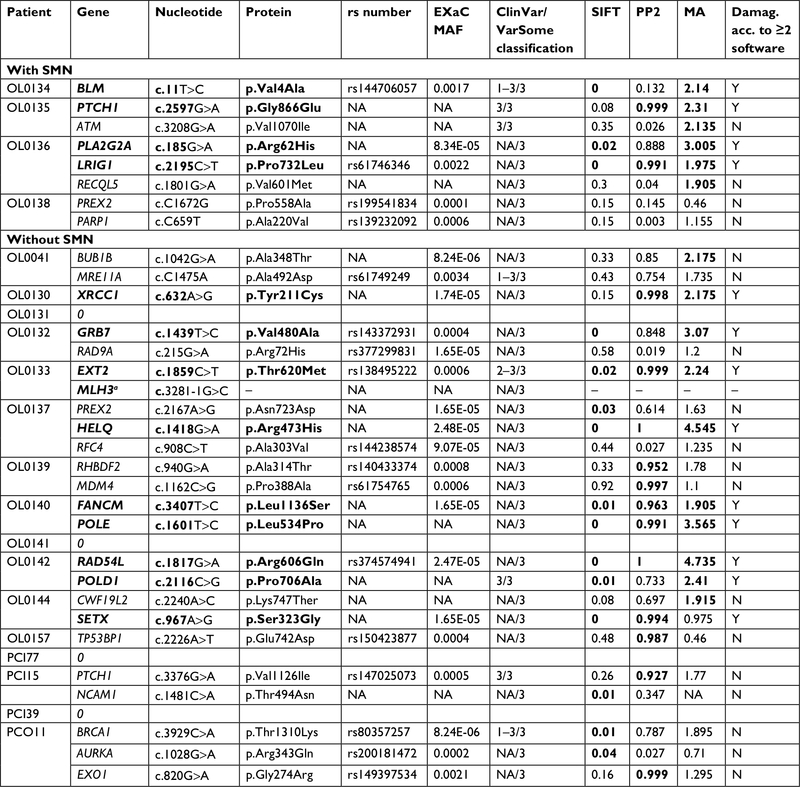 A genetic analysis of 219 hereditary cancer-predisposition and candidate genes was performed by targeted next-generation sequencing in germline DNA from 20 of these patients. Results: Of all the radically resected PDAC patients, six patients went on to subsequently develop SMNs, which accounted for 27% of the long-term survivors. The median time to diagnosis of SMNs, which included two cases of rectal cancer, and one case each of prostate cancer, malignant melanoma, breast cancer, and urinary bladder cancer, was 52.5 months. At the time of analysis, none of these patients had died as a result of PDAC progression. We identified four carriers of germline pathogenic mutations in 20 analyzed long-term survivors. One carrier of the CHEK2 mutation was found among four analyzed patients who developed SMNs. Of the remaining 16 long-term PDAC survivors, 3 patients (19%) carried germline mutation(s) in the MLH1+ ATM, CHEK2, and RAD51D gene, respectively. Conclusion: This retrospective analysis indicates that SMNs in PDAC survivors are an important clinical problem and may be more common than has been acknowledged to be the case. In patients with good performance status, surgical therapy should be considered, as the SMNs often have a favorable prognosis. The aim of the present study was to identify and describe SMNs in long-term PDAC survivors with regard to their potential genetic background. This is the first study describing the genetic background of long-term PDAC survivors with SMNs. This retrospective study involved 118 Caucasian patients with PDAC, who had undergone a curative-intent surgery between 2006 and 2011 at the University Hospital, Olomouc, Czech Republic. 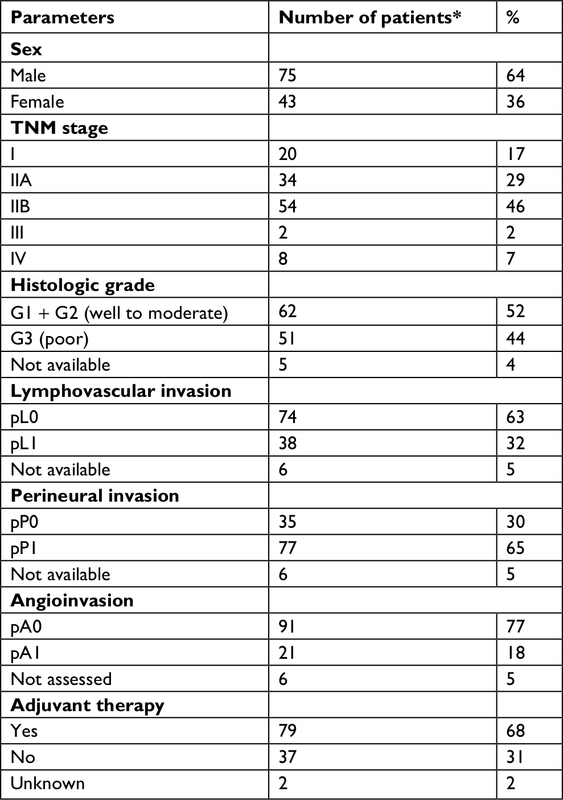 The inclusion criteria for further SMN analysis included a curative-intent surgical treatment, histologic diagnosis of PDAC independently confirmed by two experienced pathologists, at least a five-year survival period after surgery, and postresection follow-up comprising biochemical tumor marker monitoring (CA 19-9, CEA, and CA 125) every 3 months and imaging (computed tomography [CT] or positron emission tomography [PET]/CT) scans performed every 6–12 months or in the case of CA 19-9 elevation. The clinical data, including age, gender, date of diagnosis, pTNM stage,10 the histologic type and grade of the tumor, lymphatic, vascular, and perineural invasion, the therapy administered and follow-up, were obtained from medical records. 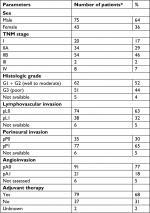 The main clinical characteristics of the whole group are summarized in Table 1. The retrospective study was approved by the Institutional Review Board of the University Hospital in Olomouc, and all living patients gave their informed written consent to participation in the study and the genetic analysis. The study was conducted in accordance with the Declaration of Helsinki. Note: *118 patients in total. The principal objective of this study was the identification of SMNs in this cohort of patients. The criteria used for the definition of SMN were derived from Waren and Gates, including a histologic confirmation of the second primary malignancy, anatomical separations of both tumors or recurrence exclusion, and a second tumor diagnosis >6 months after the diagnosis of the first tumor.2 The SMNs in the studied cohort were diagnosed by physical examination, endoscopy, and/or diagnostic imaging (CT/PET-CT) and were histologically verified. A custom-designed CZECANCA panel (SeqCap EZ choice; Nimblegen/Roche) for the germline-targeted next-generation sequencing (NGS) analysis of cancer-predisposition and candidate genes was used as described previously.12 In brief, the panel targets 219 selected genes with a known predisposition to hereditary cancer syndromes (including breast, ovarian, colorectal, pancreatic, gastric, endometrial, kidney, prostate, and skin cancers) and other genes that code for proteins involved in the DNA repair and/or DNA damage response with uncertain clinical relevance. A sequencing library was prepared using the KAPA HTP Library Preparation kit according to the manufacturer’s instructions (KAPA Biosystems, Roche) and sequenced on the MiSeq instrument with MiSeq reagent Kit v3 (Illumina). The NGS data were processed according to the in-house bioinformatics pipeline as described recently.12 In brief, SAM files were generated from FASTQ files using Novoalign v2.08.03 and transformed into BAM files using Picard tools v1.129. The VCF files prepared by GATK were annotated by ANNOVAR.13 Medium-size indel identification was based on the method of soft-clipped bases using Pindel software, and copy number variation (CNV) analysis was performed using CNV kit. During variant filtration, we excluded low-quality variants (sequence quality <30) and common variants with allelic frequencies >0.01 in ESP6500 and 1,000 genomes databases, respectively. We also excluded variants present >2× in a national database of genotypes that included 507 noncancer controls (data not shown). Nonsense, frameshift, and consensus dinucleotide splice site variants (±1/2) in known predisposition genes were classified as pathogenic or likely pathogenic. Missense variants, silent variants, in-frame indels, and other intronic variants were considered only when reaching a CADD score >2 and gerp >0 and classified according to the ClinVar and/or VarSome database. Prioritized variants were further analyzed by three prediction tools (SIFT, PolyPhen-2, and Mutation Analyzer). Variants predicted to be damaging by at least two programs were considered potentially deleterious. Twenty-two patients (19.1%) with histopathologically verified PDAC survived for >5 years since the primary PDAC diagnosis (long-term survivors) and matched the inclusion criteria for this retrospective study. The median follow-up was 6.2 years (range 5–11 years). Long-term PDAC survivors were further screened for the development of SMNs. Overall, six patients (5.1% of all radically resected PDAC patients) developed SMNs. The SMN rate among long-term survivors was 27% (N=6/22). The mean age of the long-term PDAC survivors at the time of PDAC diagnosis was 61.7±7.8 years (range 44–75 years). The subgroup of patients with SMNs consisted of five males and only one female; the mean age was 66.7±7.4 years (range 51–75 years) at the time of PDAC diagnosis. None of these patients received neoadjuvant chemotherapy. One patient was treated with chemotherapy based on 5-fluorouracil (300 mg/m2/day) concomitant to radiotherapy (50.4 Gy in 5.5 weeks) in the adjuvant setting, and the other five patients were treated with six 4-week cycles of gemcitabine (1000 mg/m2 at days 1, 8, and 22). Overall, of the long-term PDAC survivors in the present cohort, around 40% of patients who received gemcitabine postoperatively developed subsequent malignant neoplasms. The clinical and pathologic data of the patients with SMN are summarized in Table 2. Abbreviations: pT, pathologic tumor size; pN, pathologic lymph node metastasis; DFS, disease-free survival (months); NA, not applicable; SMN, subsequent secondary malignant neoplasm; TTS, time to diagnosis of SMN (months); TTT, time to therapy of SMN (months); OS, overall survival (months); GEM, gemcitabine (six cycles); R/5 FU, concomitant chemoradiotherapy with 5-fluorouracil; PDAC, pancreatic ductal adenocarcinoma. The median time to SMN was 52.5 months (range 8.8–87.1 months; Table 2). The SMNs observed included two cases of rectal cancer, and one case each of prostate cancer, malignant melanoma, breast cancer, and urinary bladder cancer. Four of these patients underwent a curative surgery for the SMN. The patient with urinary bladder cancer underwent a radical cystectomy 63 months after PDAC resection. The patient with malignant melanoma underwent a radical excision 45.4 months after PDAC resection, and the patient with breast cancer underwent mastectomy 8.8 months after PDAC resection. All these patients are still alive with no recurrence of primary or secondary malignancy (6.3–8.9 years following the primary surgery of PDAC). One patient with rectal cancer died of postoperative complications from rectal surgery 64 months after the PDAC surgery. A second patient with rectal cancer died of cardiovascular comorbidities 62 months after the PDAC surgery without a specific therapy. Prostate cancer with bone metastases was diagnosed in one patient 87.1 months after the primary PDAC resection and the patient was treated with hormonal therapy. In summary, none of these patients died as a result of the PDAC. A targeted NGS analysis covering 219 PDAC and other cancer susceptibility genes (Table 3) was performed in 20 patients both with and without SMNs (DNA samples from the two deceased patients with rectal cancer were not available). Deleterious germline mutations were identified in 4 out of 20 NGS-analyzed long-term survivors (20%; Table 4). One patient harbored two deleterious mutations (in MLH1 and ATM). Of the four sequenced long-term survivors who developed SMN, one female patient who developed breast cancer 1 year after primary PDAC diagnosis with no family cancer history carried a deleterious missense mutation in CHEK2 (c.349A>G, p.Arg117Gly). Two out of 3 carriers of a pathogenic mutation in 16 long-term PDAC survivors without SMN had a positive family cancer history. A patient with RAD51D splice-site mutation c.345+2T> G had a mother with gastric cancer and a patient with two mutations (nonsense variant in MLH1: c.390C>G and frame-shift variant in ATM: c.3849delA) had a father with a colorectal cancer and a father’s mother with brain tumor. The remaining patient with the CHEK2 c.1100delC mutation had no personal or family cancer history. Note: All variants are heterozygous. Abbreviation: SMN, subsequent malignant neoplasm after pancreatic ductal adenocarcinoma (PDAC). Subsequently, we identified several alterations with unknown impact on protein function. Fourteen variants in ten patients were predicted to be damaging by at least three prediction programs (Table 5). Notes: The variants predicted to be damaging by at least two out of three prediction tools employed are represented in bold. aThe splice-site variant was analyzed by splicing prediction software spidex with a score –25.6359, suggesting that it is the damaging variant. The unexpectedly high number of SMNs (5%) in the present cohort of resected PDAC patients may be primarily explained by the comprehensive follow-up focusing not only on PDAC recurrence, but also on SMNs. Moreover, among long-term PDAC survivors, we identified SMNs in 27% of patients, indicating that the apparently limited number of SMNs in PDAC reported so far may be largely due to the poor prognosis. Previously published reports on long-term PDAC survivors show prevalences of SMNs ranging between 0% and 20%.6,7 Nevertheless, this retrospective analysis may indicate that the development of SMNs in PDAC survivors may be more frequent than has been acknowledged in previous reports. Improved medical options including anticancer therapy and treatment individualization lead to the prolongation of survival. This is evident in survivors of various primary cancers, including PDAC survivors.17 The same trend has also been confirmed in the Czech population.18 A higher age at the time of the primary PDAC diagnosis was the only remarkable difference between five-year survivors with SMNs and those without SMNs. The incidence of cancer increases with age, and, consequently, older survivors have a higher risk of SMNs than younger survivors. All patients with a manifestation of SMN received adjuvant chemotherapy consisting of antimetabolites gemcitabine or 5-fluorouracil. Although patients who undergo chemotherapy are generally considered to be at a higher risk of SMN, an increased risk of SMNs after the use of these antimetabolites has not been reported to date. Therefore, it seems that a higher age at the time of the PDAC diagnosis and a long-term survival after a surgical and chemotherapy treatment may be regarded as risk factors for SMNs, and that such patients should be diagnostically followed. The NGS analysis revealed five clearly pathogenic variants in four patients from the long-term PDAC survivors subgroup (25%). This frequency was higher than for the other group of 96 unselected PDAC patients,19 which was 13.5% identified with a panel of 22 genes, but we are aware of the small number of patients analyzed in our study. A recent study by Yurgelun et al20 identified 28 carriers of germline pathogenic or likely pathogenic mutations in double-strand DNA damage repair genes in 289 patients (9.7%) with resected PDAC. Interestingly, the authors demonstrated that the germline mutations carriers had superior overall survival (HR 0.54; P = 0.05). This indicates that mutations in cancer-predisposing genes increase the risk of prognostically beneficial PDAC; therefore, it might be expected that an increased proportion of mutation carriers should also be found among the long-term PDAC survivors. Unfortunately, the genetic aberrations discovered do not currently seem to be of any clinical relevance with regard to potential therapeutic options. Considering the small number of long-term survivors, the frequency of pathogenic variants in the group of patients who developed SMNs (25%) and in the group who did not (19%) was comparable. These results suggest that SMN development may be due to a combined effect of variants with low penetrance or may be caused by a combination of genetic and/or nongenetic risk factors. On the other hand, the presence of germline mutations did not dramatically influence risk and prognosis of SMN. The patient with PDAC at 70 years old and subsequent breast cancer at 71 was identified to harbor a pathogenic missense CHEK2 variant (c.349A>G, p.Arg117Gly). Numerous studies and meta-analyses have shown that mutations in the CHEK2 gene are clearly associated with increased breast cancer risk and also with the development of other solid or hematologic tumors.21 We failed to find a significant association of CHEK2 germline variants with unselected PDAC cases in our previous study; however, only selected portions of CHEK2 coding sequence were analyzed.22 Since then, germline CHEK2 mutations have been identified in several studies in patients with PDAC;19,20,23,24 however, a consensual evaluation of CHEK2 germline variants in PDAC remains to be established. In a subgroup of 16 long-term PDAC survivors without SMN development, we identified 2 PDAC patients with pathogenic variants in cancer predisposition genes and a positive family history. MLH1 is a Lynch syndrome predisposition gene25 and can explain the colorectal cancer in the patient’s father. RAD51D is an ovarian cancer predisposition gene,26 but was never associated with gastric cancer. These data indicate that germline mutations in cancer predisposition genes are associated with a wider range of phenotypes than previously suggested. The evaluation of potentially pathogenic missense germline variants in candidate genes requires further analysis in larger groups of PDAC patients, as well as functional studies, because in silico predictions are suitable for variant prioritization for such analyses, but are not devoted to final variant classification. The present study, therefore, poses new questions regarding the role of genetic alterations in the development of PDAC and subsequent SMNs in patients, and regarding the modification of the clinical course of the disease. The variants identified in the present study must be verified by further investigations, also in regard to the functional impact. However, this is the first study of genetic alterations in SMNs in PDAC patients and the largest epidemiologic retrospective analysis of SMNs after PDAC treatment in Central Europe. In our cohort, 27% of five-year PDAC survivors went on to develop SMNs. An intensive follow-up can identify the second primary neoplasms early, at a curable stage. SMN risk factors include a longer survival and a higher age at the time of PDAC diagnosis. Genetic analysis has confirmed the role of pathogenic mutations in pancreatic and other cancers’ predisposition genes in long-term surviving PDAC patients; nevertheless, the frequency did not differ in the subgroups with and without SMN development. If the performance status of these patients allows and a second primary tumor has a favorable prognosis, subsequent surgery should be performed. This work was supported by the Ministry of Health of the Czech Republic (grant no. 16-28375A to BM-D, 16-29959A to ZK, and 16-31314A to PS), and the Czech Ministry of Education (no. NPU I LO1304, LO1503, and RVO: 61989592). A grant from Palacky University was awarded to TZ (IGA_LF_2018_010), Charles University Projects (UNCE/MED/006) was awarded to PSo, and PROGRES grants (Q28/LF1 and SVV 260367) were awarded to PZ, KL, and MB. The authors report no other conflicts of interest in this work. Grundmann RT, Meyer F. Second primary malignancy among cancer survivors - epidemiology, prognosis and clinical relevance. Zentralbl Chir. 2012;137(6):565–574. Lovecek M, Skalicky P, Klos D, et al. Long-term survival after resections for pancreatic ductal adenocarcinoma. Single centre study. Biomed Pap Med Fac Univ Palacky Olomouc Czech Repub. 2016;160(2):280–286. Ng AK, Travis LB. Subsequent malignant neoplasms in cancer survivors. Cancer J. 2008;14(6):429–434. Teepen JC, van Leeuwen FE, Tissing WJ, et al. Long-term risk of subsequent malignant neoplasms after treatment of childhood cancer in the DCOG LATER study cohort: role of chemotherapy. J Clin Oncol. 2017;35(20):2288–2298. Minni F, Casadei R, Marrano N, et al. Second tumours in patients with malignant neoplasms of the digestive apparatus. A retrospective study on 2406 cases. Ann Ital Chir. 2005;76(5):467–472. Jacobs NL, Que FG, Miller RC, Vege SS, Farnell MB, Jatoi A. Cumulative morbidity and late mortality in long-term survivors of exocrine pancreas cancer. J Gastrointest Cancer. 2009;40(1–2):46–50. Gerdes B, Ziegler A, Ramaswamy A, Wild A, Langer P, Bartsch DK. Multiple primaries in pancreatic cancer patients: indicator of a genetic predisposition? Int J Epidemiol. 2000;29(6):999–1003. Riall TS, Stager VM, Nealon WH, et al. Incidence of additional primary cancers in patients with invasive intraductal papillary mucinous neoplasms and sporadic pancreatic adenocarcinomas. J Am Coll Surg. 2007;204(5):803–813. Chen KT, Devarajan K, Hoffman JP. Morbidity among long-term survivors after pancreatoduodenectomy for pancreatic adenocarcinoma. Ann Surg Oncol. 2015;22(4):1185–1189. Sugimura H, Caporaso NE, Shaw GL, et al. Human debrisoquine hydroxylase gene polymorphisms in cancer patients and controls. Carcinogenesis. 1990;11(9):1527–1530. Soukupova J, Zemankova P, Lhotova K, et al. Validation of CZECANCA (CZEch CAncer paNel for Clinical Application) for targeted NGS-based analysis of hereditary cancer syndromes. PLoS One. 2018;13(4): e0195761. AIRTUM Working Group. Italian cancer figures, report 2013: Multiple tumours. Epidemiol Prev. 2013;37(4–5 Suppl 1):1–152. Hackert T, Tjaden C, Müller S, et al. Extrapancreatic malignancies in patients with pancreatic cancer: epidemiology and clinical consequences. Pancreas. 2012;41(2):212–217. Schnelldorfer T, Ware AL, Sarr MG, et al. Long-term survival after pancreatoduodenectomy for pancreatic adenocarcinoma: is cure possible? Ann Surg. 2008;247(3):456–462. Pavlík T, Májek O, Büchler T, et al. Trends in stage-specific population-based survival of cancer patients in the Czech Republic in the period 2000-2008. Cancer Epidemiol. 2014;38(1):28–34. Hu C, Hart SN, Bamlet WR, et al. Prevalence of pathogenic mutations in cancer predisposition genes among pancreatic cancer patients. Cancer Epidemiol Biomarkers Prev. 2016;25(1):207–211. Yurgelun MB, Chittenden AB, Morales-Oyarvide V, et al. Germline cancer susceptibility gene variants, somatic second hits, and survival outcomes in patients with resected pancreatic cancer. Genet Med. Epub 2018 July 2. Havranek O, Kleiblova P, Hojny J, et al. Association of germline CHEK2 gene variants with risk and prognosis of non-hodgkin lymphoma. PLoS One. 2015;10(10):e0140819. Mohelnikova-Duchonova B, Havranek O, Hlavata I, et al. CHEK2 gene alterations in the forkhead-associated domain, 1100delC and del5395 do not modify the risk of sporadic pancreatic cancer. Cancer Epidemiol. 2010;34(5):656–658. Chaffee KG, Oberg AL, McWilliams RR, et al. Prevalence of germ-line mutations in cancer genes among pancreatic cancer patients with a positive family history. Genet Med. 2018;20(1):119–127. Young EL, Thompson BA, Neklason DW, et al. Pancreatic cancer as a sentinel for hereditary cancer predisposition. BMC Cancer. 2018;18(1):697. Nallamilli BRR, Hegde M. Genetic testing for hereditary nonpolyposis colorectal cancer (HNPCC). CurrProtoc Hum Genet. 2017;94(1):10.12.1-10.12.23. Eoh KJ, Kim JE, Park HS, et al. Detection of germline mutations in patients with epithelial ovarian cancer using multi-gene panels: beyond BRCA1/2. Cancer Res Treat. 2018;50(3):917–925.